This sword belongs to Jyojyo saku ranking. 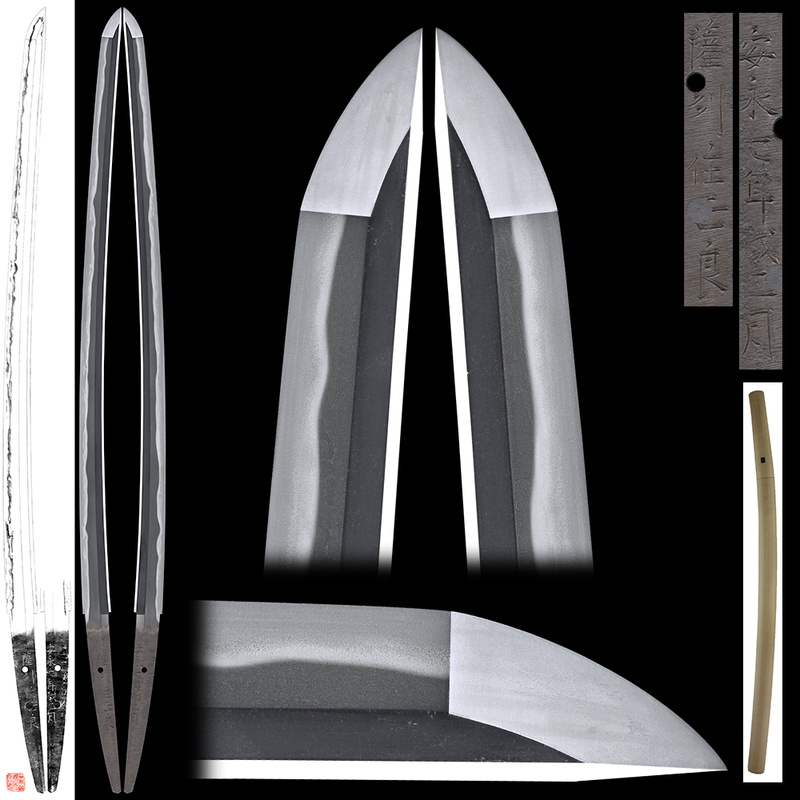 Blade length : 70.599 cm or 28.8 inches. Sori :1.5 cm or 0.59 inches. Width at the hamachi : ３.２５５ cm or 1.28 inches. Kasane : 0.685 cm or 0.26 inches. Jigane : Koitame-hada well grained with Nie attached fine Chikei inclueded gloss Jigane . Hamon : Nie-deki, deep Nioikuchi Notare and Gonome mix with Jinchu Saryu Kinsuji working. Boshi is Midarekomi Yakisage shape. Special feature: Sassyu Ju Masayoshi is student of Masachika and called himself Ichi at first. At Kansei 1st he became Hoki-kami and he changed his name as Masayuki. He died at Bunsei 2 (1819) when he was 87 years old. He cut the signature Sassyu-Ju Masayoshi, Satsuma Kanko Taira Masayoshi, Hoki Kami Ason Masayuki. He was ordered to be sword maker by Satsuma daimyo family. He got the title of Hoki Kami at Kansei first year December 1st. After that he gave the name Masayoshi to his eldest son. This sword is wide and thick with big kissaki healthy blade. kinsuji . at a glance, the blade looks Sosyu upper class like Go. 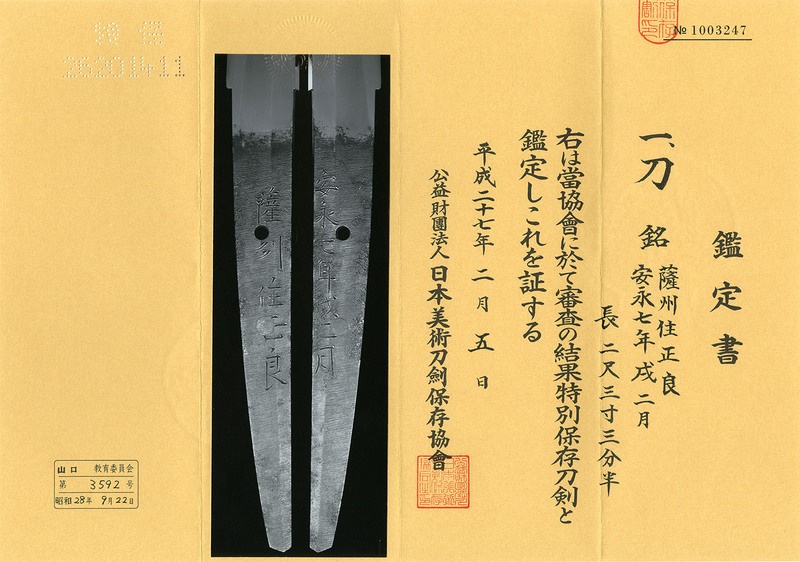 The blade is displayed typical Satsuma sword powerful and tremendous impact feeling. The sword looks Go who was working at Kamakura period. At Satsuma province, Masayoshi and Motohira are reformed to as the twin jewels of the sword society. Anyway this sword is healthy and wild feeling attractive Satsuma blade. This sword was forged when Masayoshi was 47 years old.